What does a sloth do on an average day? Sloths as we all know are rather docile creatures and they don’t really lead an exciting life. In fact, there life can be pretty much summed up into 6 key activities. Sleepy Sloths – How long do sloths sleep for? Sloths sleep on average 10 hours a day, although people once believed they slept for up to 18 hours a day! This is a common myth that many people still believe. They also sleep whilst hanging which you would think would be tiring and impossible to sleep, but sloths are specifically designed so they can hang and sleep at the same time! Hungry Sloths – What do sloths eat? 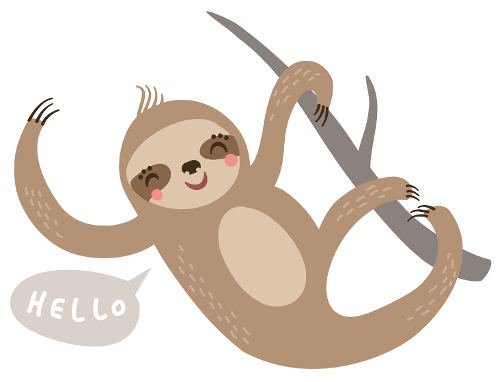 Sloths spend pretty much all of their day eating leaves from the tree they’re dangling in. The other 5% will be spent moving around the tree to get to more leaves. It’s very rare a sloth will be doing anything else other than eating and sleeping. This is pretty much their entire life. Sleeping and eating. The dream. The bulk of the sloths diet consists of leaves, buds, and tender shoots, but they don’t turn down a good opportunity. If they stumble upon some tasty flowers or fruits up in the tree, they won’t hesitate to chow down and get a full tummy. The Cecropia tree is the sloths favorite tree. The typical sloth will spend most of its life in these types of trees, we can safely assume it’s their favorite. Sloths don’t discriminate though, they have been seen munching on over 50 different types of tropical trees in the American rain forests. The Cecropia tree shares its home with hundreds of different species. One of the most noticeable is the Azteca ant. This ant protects the tree and keeps it healthy, so you can bet that they don’t like the sloths hanging around. Do sloths care? Nope. Sloths do what they want. Sloths are not picky eaters, if a meal crosses their path they will gobble it up without a seconds thought. Lets just say if you were a big fat insect, you should be scared of sloths. They will literally eat anything they can get their little claws on. Flies, caterpillars, ants, eggs, beetles… You get the idea. They are opportunists. Some sloths have even been seen eating small reptiles and even birds! How a slow sloth manages to pull that off I have no idea. All this eating and hanging must be pretty tiring, right? So how do they go about getting water? Sloths actually get all the water they need from the trees. There is enough water in the leaves to keep them going and they lick the dew off the leaves in the morning. They also take advantage of the rain, since they live in rain forests. With a rough diet like this, the sloth needs a killer digestive system to digest all those leaves and shoots. The reason they can eat leaves and sustain themselves is because they have a stomach that is split up into three parts. We only have one stomach, food goes in, our stomach digests it and we get on with our lives. Leaves are a lot harder to break down, that’s why sloths eat them and we don’t. The first two compartments in a sloths stomach are filled with symbiotic bacteria which breaks the leaves down. The broken down produce then moves into the third compartment where it is digested fully and then it ends up getting turned into sloth poop. This process takes a very long time, nearly a whole month in fact. Because of this, two thirds of a sloths entire body weight is actually half digested leaves! They are literally bloated 24/7. No thanks! Don’t read that the wrong way… Sloths hang around their entire life. When they’re babies they hang onto their Mum and when they’re adults they hang onto branches on the tree. The only time they will ever stop hanging is to climb down the tree and poop on the floor. In fact sometimes when a baby sloth falls to the ground the mother sloth will stay in the tree hanging instead of going down and getting the baby sloth! This is because they don’t want to be vulnerable to predators. Since sloths spend the majority of their life hanging upside down, they have evolved differently to ever other mammal. Their fur actually grows in the complete opposite direction. This provides protection from the elements. Sloths also cannot shiver, so it’s a good job they have this really well designed protective fur. Living in a tropical climate helps as well. The way sloths are built is truly remarkable. They are so well designed for hanging, it takes almost zero effort. In fact, if a sloth dies whilst in a tree, it can actually remain hanging there. The benefit to this is its a good deterrent for poachers and exotic pet hunters. This is the only time the sloth will stop hanging and leave their tree as I mentioned earlier. They do their business at the very bottom of the tree instead of hanging and pooping at the same time. Nobody knows for certain why they don’t just poop whilst dangling. The leading theory is the sloths poop at the bottom to nourish the tree! Bathroom breaks aren’t frequent for sloths like they are for us. Imagine how much time they would waste climbing up and down a tree four times a day, especially at the speed of a sloth. It just wouldn’t be practical. Instead, sloths hold it in and only venture down once a week! So not only are they clogged up with a months worth of leaves and food, they are also blocked up with a weeks worth of poop. I really wouldn’t like to be a sloth. You may be wondering how the sloths manage to stay hydrated if they never leave the tree. Sloths spend the same amount of time drinking as they do eating. They don’t actively drink water, but they lick the dew off leaves and get all the water they need. This is perfect for their survival because they would be super vulnerable if they went down the tree to drink out of a poo-flavored puddle! While we’re on the topic of water, sloths are actually fantastic swimmers! They can actually swim faster than they can crawl through the trees. Some times accidents happen and both adult sloths and baby sloths fall from their favourite branch. Some silly sloths have even been seen mistaking their own arm for a branch and then falling out of the tree! Sloths are incredibly well built and rarely die from falls, even if they slam into the ground. They have a nice ‘bounce’ to them, especially the baby sloths. When a baby sloth falls from momma sloth, it isn’t the fall that kills them. Predators usually finish the job because sloths move so slowly that it can take momma sloth hours to make it down to retrieve the baby sloth. Some times the mother sloth doesn’t even bother crawling down the tree to try and save her baby because the threat of looming predators is enough to scare her away. Anyway, we went a bit off topic there… When sloths fall into rivers they take advantage of the free water and take as much on as they can so they’re nice and refreshed. Lets be honest. Have you ever seen a sloth not be awesome? Even when they die they’ll stay hanging to their branch and their sexual sessions with their partner last less than 20 seconds! A truly majestic animal. Not enough people recognize the glory of the sloth. This cute sloth video was created by SeaWorld and shows you all the cute things you could be doing if you were a sloth! What would you do if you were a sloth for a day? Hi, I’m researching sloth facts for an internship I’m doing. Could you please cite your source for me on the information you posted about mothers not going down to the ground to rescue their babies when they fall? Thank you in advance!